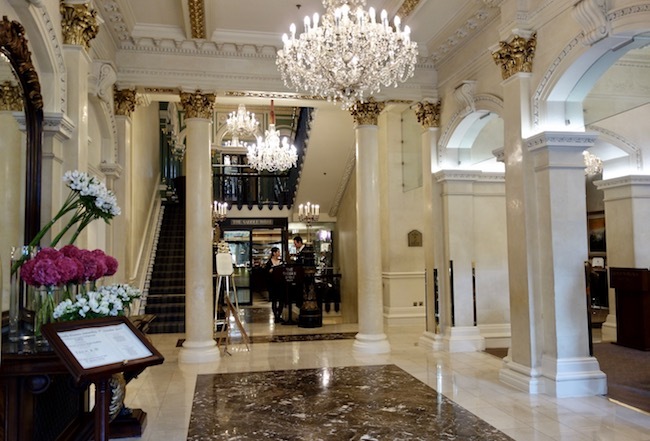 When it comes to luxury hotels in Dublin, the Shelbourne Hotel Dublin is one of the best. A home away from home for royalty, politicians and rock stars … and occasional strays like me, it has a five-star pedigree, a lively social scene and a fascinating past. Here’s my review. I waltzed into the cream-coloured lobby of the Shelbourne Hotel past doormen in top hats, pale gilt-tipped columns and crystal chandeliers. Checking in I discreetly looked around hoping to see some sort of James Bond action going on. 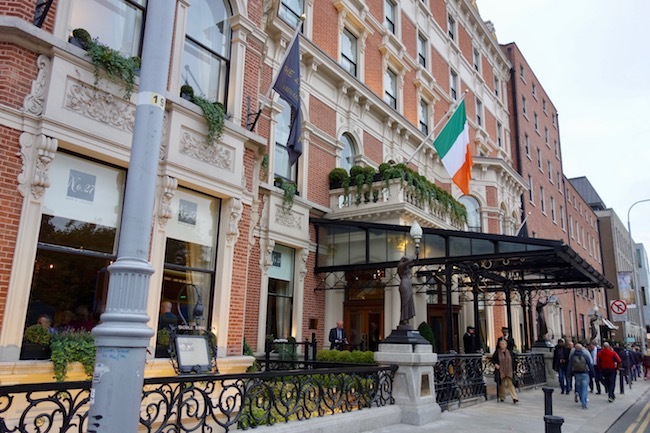 After all, Pierce Brosnan, Timothy Dalton, Roger Moore have all stayed at this 5-star Dublin hotel, and who knows how many unnamed actual spies stayed here during the wars? We do know that during World War II the writer Elizabeth Bowen was known to file top secret reports to Winston Churchill based on intel she’d gathered here over the hotel’s Afternoon Tea, and if that’s not a hotbed of scone-centred excitement I don’t know what is. A lot has gone on at the Shelbourne over the years. The Irish Constitution (Bunreacht na hÉireann) was first drafted here in 1922. The room (112) it happened in is now called the Constitution Suite and is probably the most famous banqueting room in Dublin. With a prime position on the northern end of St Stephen’s Green, the Shelbourne Hotel has attracted the crème de la crème of society since it first opened in 1824 (present company excepted). To me the elegant exterior looks a bit like a frosted layer cake, but to describe it properly let me just add that it’s a Renaissance style made of red brick and Portland stone and embellished with ivory-coloured stucco. Jazzing up the refined lines are the somewhat surprising granite pedestals at the entrance that hold the torch-bearing bronze figures of two Egyptian princesses and two Nubian slave girls, a quartet that has been referred to – but not by me – as the last four virgins in Dublin. After I put my bags in my Queen Room, which, while very nice with its Rivolta Carmignani Egyptian cotton sheets and and neutral beige colour scheme, does not have the spacious allure of Suite 270, a favourite of the late Princess Grace of Monaco and now known as the Princess Grace Suite. Sadly, my budget didn’t nearly come close. Neither was I in the Tonga Suite where John F. Kennedy stayed with his wife Jacqueline in 1958. I wasn’t even in a Heritage Park Room or a …. Oh, shut up, I told myself. You’re in one of the most fabulous hotels in Ireland. Anyway, I wasn’t here because of the room. I was here because the hotel is where James Cagney once danced on the grand piano, where Peter O’Toole bathed in champagne and where comedian Oliver Hardy’s ample bottom got hopelessly lodged in a chair. I was here because the Shelbourne Hotel is one of those bucket list places to stay that ranks with any luxury hotel in the world. I wasn’t going to see any celebrity antics by sitting in my room so I rooted through my luggage searching for something impressive to wear (as in not too wrinkled) and got ready to go downstairs. Although, I supposed, as I freshened up in the white and grey marble bathroom, it’s possible the ghost of Mary Masters, a young girl who died from cholera might make an appearance. According to Lily Collins, the Hollywood actor and daughter of musician Phil Collins, seven-year-old Mary paid her a visit while she (Lily, not the ghost) stayed at the Shelbourne while filming The Mortal Instruments: City of Bones. By all accounts Mary is more mischievous than malevolent and since I wasn’t in room 526 where she’s been said to appear, I was probably all right. I wouldn’t mind a few unexpected appearances however. Like maybe the Chieftains, one of Ireland’s top bands, could show up at the hotel’s Horseshoe Bar as it’s where they came up with the idea for the band. Then there were the literary greats such as William Makepeace Thackery and Rudyard Kipling who also once patronized the Horseshoe Bar. Who knows what future greats I could run into there? The problem was that I’d decided to swan around the hotel at an off time. The Horseshoe wasn’t yet open and Afternoon Tea in the Lord Mayor’s Lounge was completely sold out. I would have opted for the pre theatre dinner at the very posh Saddle Room but it didn’t open until 5:30 and the No. 27 Lounge wasn’t available – possibly for a private function. I explained to the very kindly staff that I needed to eat a meal at this unlikely hour because I was, er, hungry. “Are you a guest here?” they asked. Those were the magic words. Somehow I was found a table and a menu. It didn’t matter that I wasn’t in the Princess Grace Suite or hadn’t drafted the Irish Constitution after all. Just being a guest at the Shellbourne had found me a seat in the house. The Shelbourne Dublin is the top luxury hotel in Dublin. Well, some might say the Merrion is, but let’s not quibble. 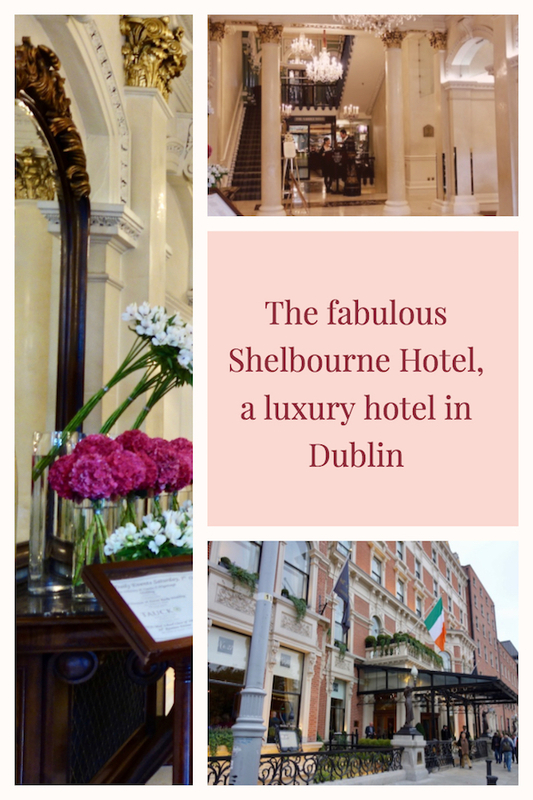 With 265 rooms the Shelbourne is the largest luxury hotel in Dublin. The hotel has a spa, pool, barbershop and even its own mueum. It even has a genealogy butler to help you discover your Irish roots. If I’d known about this at the time, I would have made good use of him. You wouldn’t think that with a name like Perehudoff I would have Irish ancestors but I’m an eighth Scotch Irish. Does that count? The Shelbourne Dublin is a Renaissance Hotel, which is owned by Marriott. Queen Rooms are the smallest. Book a Heritage Park View Room if you want a view of St Stephens Green. 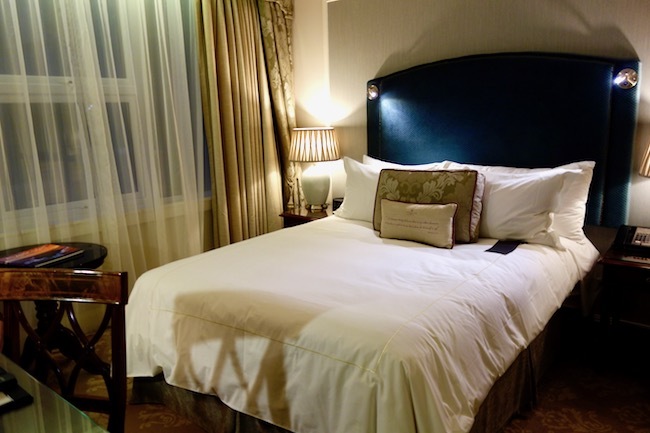 Price: Hotels in Dublin aren’t cheap, and the Shelbourne is no exception. My Queen Room cost me a whopping 362 Euros, about $450 USD. Of course it depends on what day and season you’re travelling in. All I can say is good luck. Afternoon Tea at the Shelbourne Hotel Dublin: The Lord Mayor’s Lounge offers a daily high tea, which is practically an institution in Dublin. Price starts at 49 Euros and includes fancy sandwiches such as a House Smoked Castletownbere Salmon with Mustard Emulsion, Pickled Cucumber and Guinness Bread. You’ll get classic buttermilk scones and treats such as a Lemon and Poppy Seed Cake with Raspberry Pot Crème and Lemon Gel, and Vanilla Cheesecake with Strawberry and Lime. The Saddle Room is a fine dining restaurant with a focus on steak and seafood. This is where to get your 28 Day Aged Hereford on the Bone Rib of Beef or Loin of Wicklow Venison. The No. 27 Lounge offers front row window views onto St Stephen’s Green and has a more informal menu. Signature cocktails include a Shelbourne Bramble with Gunpowder Gin, Sugar, Lemon, Raspberry and Apple Coulis. The Horseshoe Bar is the place to go if you want to mix and mingle with Dublin movers, shakers and drinkers. Where else can you indulge in a Horseshoe Bar Whiskey Tasting Flight surrounded by Hogarth prints, lots of brass and warm red walls? As I may have mentioned, the Merrion is the Shelbourne’s main rival for luxury hotels in Dublin. The Merrion is known as an art lover’s hotel and has the largest private collection of 19th and 20th century art in Ireland. I always thought the Clarence would be my top choice as it’s owned by Bono and The Edge from U2, but it’s surprisingly plain. Still, this popular 4-star hotel in Dublin has an unbeatable location on the banks of the Liffey and has a 24-hour cafe and bar – and who knows what top musicians will stop in? Read more about travelling in Ireland. If you’re looking for unique hotels, you might want to read my hotel review of the funky and fabulous Leslie Castle. Or check out these top spa hotels in Ireland. Looking for other luxury hotels in Ireland? Here’s my review of Castle Leslie. Visit the Tourism Ireland website for more information on travel to Ireland or Ireland’s Ancient East. Love your blog! I agree…the Shelbourne is a beautiful hotel. Spent a night there in January on my way to a writer’s retreat in Gorey. An absolute treat and fun to read about its rich history.